Could the Slate be the future of home shopping? Technically, the Slate is an 'Edy PC', a new computing platform supported by Japanese PC maker PBJ in combination with Intel and BitWallet , a leading e-cash provider part owned by Intel. It's aimed squarely at people who are not computer literate. The first device is due late this year and appears similar to a Tablet PC, but with a few crucial differences. 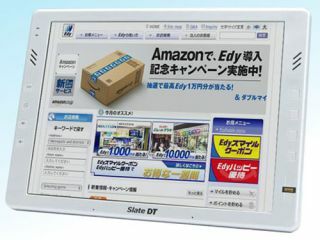 Most significant is the inclusion of an Edy IC card reader that can handle e-cash payments for online purchases made using several of the real-world electronic-payment cards that are popular in Japan. The concept is likely to appeal to people wary of using credit cards online. Particularly as the chips are already in millions of mobile phones. Elsewhere, there is a lot of standard Tablet PC hardware, such as a touchscreen, a webcam, Wi-Fi and USB ports, plus Windows Vista on the software front. The Edy PC platform calls for storage to come courtesy of a solid-state drive to make machines more rugged. Although the Slate will feature a normal HDD for at first. The concept of a truly simple, but powerful, PC for newcomers still seems some way off. But PBJ plans to at least make escaping the clutches of Windows a doddle by including a big, red, hardware reset button on the case.